Maybe it’s the weather — the handful of warm, sunny days we’ve enjoyed recently — but something seems to be triggering that age-old instinct to clean in spring. The first phase of this annual ritual, of course, is purging our homes of unwanted, unused and untidy mounds of stuff. I’ve heard a number of people proclaim that this is absolutely going to be the year they take back the den from the kids or get to see the floor of their garage or basement. Some want to pare down in an effort to further simplify their lives. Others are at a particular stage in the mourning of a parent or other loved one when they are finally ready to part with that person’s household possessions, long kept in a self-storage unit or a relative’s attic. Whatever the motivation to purge, however, it always leads to the same pressing question: Exactly how do I go about getting rid of this stuff? Finding the answer can be frustrating. Some charities say they simply don’t have room for more donations. Others are very particular about what they’ll take and when. And when the items in question are electronic or in some other way potentially toxic if they ultimately end up in landfill, it can be an additional challenge to find an environmentally responsible solution. Fresh is always on the lookout for answers (and you’ll find some at Links & Resources, under “Recycler’s Toolkit””). But one terrific opportunity is coming up right away: the Stockton Borough School’s Annual Rummage Sale. Known to members of the school community as “the rummage,” the event is an annual fundraiser for the Stockton elementary school, located on Rt. 29 in Stockton, New Jersey. Of course the Rummage Sale itself is an entertaining way to do just a bit of recluttering. You really never know what you’ll find… and one person’s junk truly is another’s treasure. 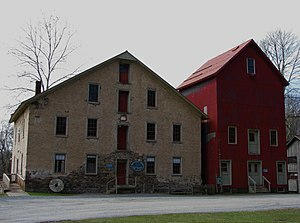 The sale takes place at the Prallsville Mill, Rt. 29, Stockton, NJ, next weekend, Saturday, March 17, 9 a.m. to 4 p.m., and Sunday, March 18, 9 a.m. to 1 p.m. Items are 1/2-price on Sunday, starting at 9 a.m. The finale is a bag sale, from noon to 1 p.m. (a truly amazing bargain for hardy rummagers). Want more information about donating and recycling? As part of the Fresh commitment to help people in the area live more sustainably, this type of information is posted on the Links & Resources page. The link is far from complete, but it is a work in progress. In time, Fresh wants to make it an easy, at-a-glance way to find out how you can get rid of nearly anything while supporting your community and protecting the environment. Sunday would be the 18th, eh?